Raaga.com: Lessons in endorsements that Bollywood actors needs to learn from South film Stars! Lessons in endorsements that Bollywood actors needs to learn from South film Stars! The recent news about a F.I.R. being launched against Bollywood superstar Ranbir Kapoor and ace film actor-director Farhan Akhtar for promoting a portal that allegedly is involved in ‘duping’ customers has once again opened the Pandora’s Box that should film celebrities endorsing products must be held liable for misleading advertisements? According to K V Thomas, Chairman of Central Consumer Protection Council (CCPC) a misleading commercial by a leading film celebrity on TV; even for a single day helps the advertisers to deceive millions of gullible consumers, who are tempted to buy the product solely trusting their favorite celebrity endorsing the product. While on one hand we observe Bollywood stars endorsing advertisements despite cases against them like few months back, Amitabh Bachchan, Madhuri Dixit and Preity Zinta were slapped with notices by the Tamil Nadu consumer forum for promoting Maggi noodles on "false representations" about quality and safety. On the other, if we look down South film Industry we observe that many popular film stars have made it a rule not to endorse any product knowing very well that their word is taken as a ‘word of God’ by their fans. Hence in case the product proves bogus than their dignity and decorum is at stake. South Cinema’s greatest superstars viz. 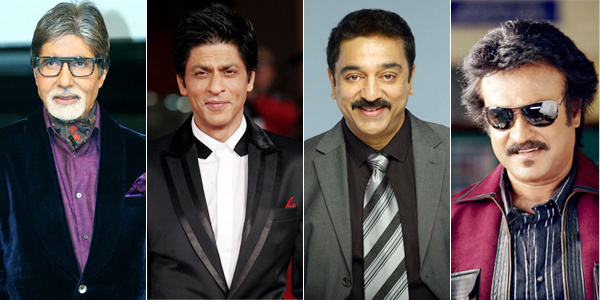 Kamal Haasan and Rajinikanth have thus stayed away from endorsements. Nevertheless the two have always come forward for advertisements that promote social cause. Another big name in South Cinema Thala Ajith too has made it a practice not to endorse any product that is harmful to health and has hence turned down offers from Coke and other beverages, despite offers of huge remunerations. However recently the media is hype about film star Kamal Haasan breaking his 50 year long vow of not endorsing products and will be doing a commercial for Pothys, regarded as a leading chain of textile and jewellery showrooms in Tamil Nadu. “The entire sum of money received from the endorsement will be donated for welfare of AIDS patients, particularly the innocent kids who are suffering due to the deadly virus,” he quipped. Truly an eye-opener for Bollywood star, who despite getting hefty amount from the film assignment, run after more money endorsing products caring a damn, whether it harms or cons the innocent consumers!! !